How does Nexternal's shopping cart increase your conversion rate? Simple. By providing a more-friendly shopping experience for your customers. Since day one, Nexternal's ecommerce software has always included an always onscreen shopping cart. Why does this matter? Customers can always see what is in their cart and they are never taken away from the core catalog. Many ecommerce systems have separate shopping cart screens. The problem with this structure is that a customer never knows where they are going to be directed when they "continue shopping." The onscreen shopping cart takes the mystery out of the shopping experience. If you run promotions that kick in at certain price or quantity thresholds, you can add a dynamic message to the always on screen shopping cart encouraging customers to purchase more. This has been tremendously successful for Amazon.com. For example, you might configure a message to appear in the cart that says, "Wait! Spend just $10 more to qualify for free ground shipping." This is a proven technique for increasing average order size. If an online store doesn't look professional, customers are likely to look elsewhere. When a client signs up to use Nexternal's software, Nexternal's talented design team will go to work synchronizing the look and feel of the store with that of the merchant's web site. This provides a seamless transition to the secure shopping cart and will make customers feel comfortable in placing an order. Nexternal's ecommerce software provides multiple methods of navigation in the shopping cart. A navigation thread or "bread crumb navigation" is one option. Customers can also use a drop down category list to visit areas of the site. Merchants can also aid customers by putting products into multiple categories. Should a customer get to the end of the ordering process and then decide to add more items to their order, Nexternal's shopping cart remembers where they have been and returns them to the final checkout screen. Often times it is buyers that will use a search. They know what they want and want to find it quickly. Providing a good search tool is paramount to having a successful online business. Nexternal uses a sophisticated algorithm to return the most relevant results at the top of the search results screen. Single click reordering allows customers to select previously placed orders and easily duplicate them. This saves returning customers time and provides convenience. Customers in today's world do not like surprises. Allowing customers to determine shipping and sales tax before clicking check out has been proven to increase conversion. Nexternal's shopping cart includes this capability in the onscreen shopping cart. Nexternal's software can be configured to display expected delivery dates upon checkout. Nexternal takes this one step further by allowing customers to choose a desired delivery date before checking out. This is especially useful when purchasing, for example, a birthday gift. Customers appreciate knowing when items might arrive based upon their selected shipping methods and these tools result in a more satisfied customer. International shoppers have the option of displaying prices is their own currency. Those converted prices are carried through the entire order process. Around the gift giving season, many shoppers want to place one order and yet ship line items to multiple locations. Nexternal's multiple ship to functionality allows this to happen. A customer can create separate shopping carts for different locations. This is a must have for gift focused companies. Sometimes you just need to plant the seed. By displaying related products on a product detail screen, you have a chance to upsell the shopper on items they may not have originally intended to buy. This leads to larger average order sizes. Do all of these features make a difference? Absolutely. Increasing conversion rate by even a small amount can have a significant impact on sales revenue. 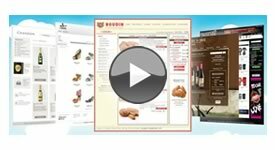 To see just how easy it is to order using Nexternal's shopping cart, visit our online demo.